When this card is sent to the Graveyard, you can activateits effect. You can then equip it to a monster on the field, and this card will be treated as an Equip Spell card that decreases the ATK of the.. This card cannot be Special Summoned. This card returns to the owner's hand during the End Phase of the turn it is Normal Summoned or flipped face-up. This card can attack all monsters your opponent c.. This card cannot be Normal Summoned or Set. 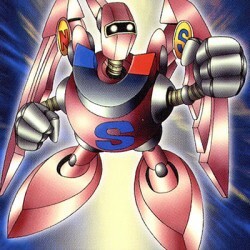 This card cannot be Special Summoned except by Tributing 1 "Blue-Eyes Ultimate Dragon" you control. This card gains 3000 ATK for each Dragon-Type monster i.. This card cannot be Normal Summoned or Set. This card can only be Special Summoned by removing from play 3 Fiend-Type monsters in your Graveyard. If this card is destroyed in battle or by your opponen..
Activate only when an opponent's monster declares an attack. Negate that attack, and select another face-up monster your opponent controls. That monster attacks instead. (if it is in a face-up Defense..
At the end of your opponent's turns, place 1 'Spirit Message' card from your hand or your Deck face-up on the field. If you control the 'Spirit Message' cards 'I', 'N', 'A' and 'L' in the proper order.. When this card inflicts Battle Damage to your opponent, you can either: Discard 1 random card from your opponent's hand. OR Send the top 2 cards from your opponent's Deck to the Graveyard. ..